Most of our Viking pendants are available in either sterling silver, or a rich golden bronze. We also have a selection of pendants in amber, iron, natural quartz crystal and polished wood. Some of our Viking pendants are direct replicas, some have Viking designs taken from Viking artifacts and others are modern interpretations of old Norse jewelry. We probably have the widest collection of Viking jewelry on the web, so please select a pendant type below to view what we have in store. Thor’s hammer, also know as Mjollnir / Mjölnir / Mjøllnir, is a popular pendant found in Viking burial sites. Wearers of the Thor’s hammer pendant hope to invoke the favour of the thunder and fertility god Thor. The pendant represents Thor’s hammer, which he employs to create thunder and to smite the frost giants. 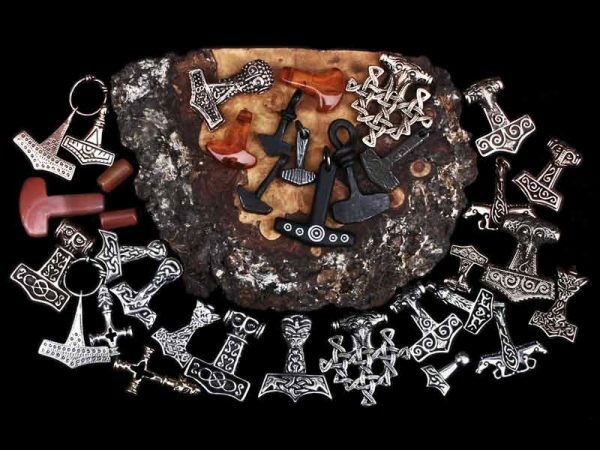 The Thor’s hammer pendants we have are either direct copies of Viking age finds, or have designs taken from other genuine Viking artefacts.